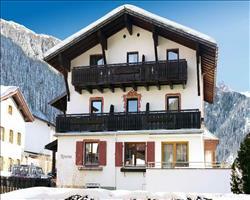 This friendly, spacious chalet hotel is situated in the quiet hamlet of Nasserein, just at the edge of St Anton. The slopes and the ski school are just a 5 minute shuttle bus away, or you can ski down to the piste. 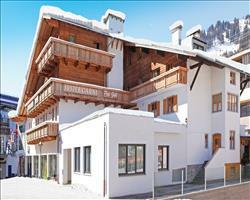 St Anton itself is within easy walking distance of the hotel. 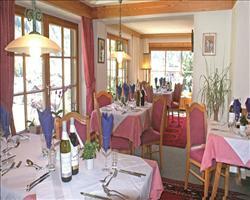 If you prefer a more quiet and peaceful location then the Chalet Hotel Schweizerhof is your answer. Ideal for families! 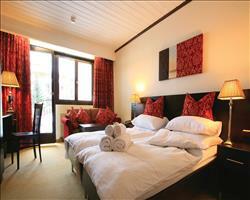 Chalet Hotel Schweizerhof is extremely comfortable. Warmly decorated with wood panelling and rich colour schemes, and large picture windows to make the most of the views. Children are well catered for too with a large brightly coloured crèche and outdoor play area fully staffed by a team of fun-loving nannies, who will do their utmost to make sure our younger guests are well entertained and enjoy their holiday as much as you do. The crèche is open from 9am to 5.30pm and our nannies will also supervise lunch and high tea for you, so you can enjoy guilt-free skiing for as long as you like. The hotel has a health and beauty salon - where you can indulge in an aromatherapy massage or body wrap or just relax in the sauna and steam room and relax any ski aches and pains. 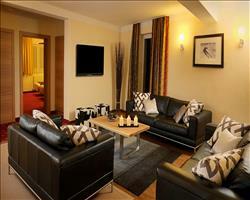 On the first floor there is a large open plan dining room, a well stocked bar and cosy lounge. 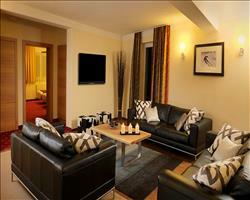 The bedrooms are spacious, well furnished and all have en-suite bathrooms and televisions. Most rooms will take an extra child's bed and if you are travelling with younger children there are a number of inter-connecting rooms. Dining is plentiful and our chefs put on a fabulous daily spread of breakfast, tea and dinner. From a good hearty breakfast to a decadent high tea including home-made cakes, biscuits, fresh bread and soup. And to round the day off, a delicious three course evening meal with complimentary wine. Please Note - One evening a week dinner is not served in the Chalet Hotel giving you the chance to dine out at one of our excellent local restaurants. 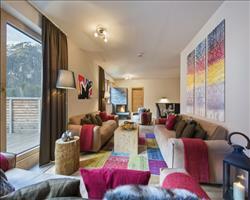 We update Chalet Hotel Schweizerhof's details often, but facilities do change. e.g. some extras listed by the supplier as "free" or included might only be for the first time you use them, or for one time per party, then charged for further use. If any specific feature is essential to your holiday, make sure you ask us to confirm the details of it before you book your holiday. St Anton lift pass price last reported as €228 (adult 6 day). 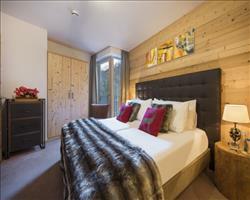 Ask for a quote when booking Chalet Hotel Schweizerhof. 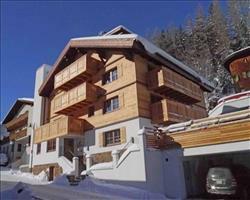 Chalet Hotel Rosanna St Anton Austria, Gatwick to Friedrichshafen 5th January. 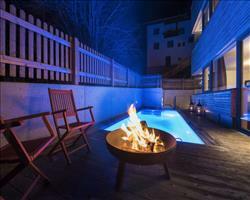 Chalet Alpenheim St Anton Austria, Gatwick to Innsbruck 14th December. "Good family option but prefer closer to slopes"
My first impression was that the chalet hotel was dated, the whole place could do with being knocked down and done up. You have the hotel and then there’s also an annex bit with an underground link between the two. I’m glad we stayed in the annex part rather than the main hotel as the rooms we had were really huge, with 2m worth of wardrobe space that was a good 8 foot high. We had Austrian twins (2 singles next to each other) and our child was on the camp bed – you could have easily fit another child in there. If the bathroom was in a house, you’d say it was a good sized family bathroom, it was very clean but a bit dated and quite dark. Our room also had a little door which opened out into an outdoor area. In terms of the food, we started off the week saying it was the best ski food we’d ever had… it was the kind of food you’d get in London, real MasterChef stuff with 10 different things on each plate. It was good and at the end of the day it depends what you like, we would have preferred a good hearty casserole after a day of skiing and by the end of the week it was way off the boil. Breakfast was very good and without a doubt the best I’ve had on a ski holiday. Every day we had sausages, bacon, hash browns, cooked tomatoes, scrambled eggs etc. They also did an afternoon tea which was really good with a choice of cake (always including a loaf cake of some sort), biscuits, soup and fresh bread. The Schweizerhof’s location is one of the reasons we wouldn’t go back. It’s an 8 minute walk (with trainers on) down to the Nasserein lift. They do run a shuttle bus but it didn’t start until 8:30am for children and 9am for adults which didn’t work too well for us. Because we were here late in the season, we always finished skiing by 1-2pm but had to wait until 3:30 if we wanted to get the bus back, or walk, which with little ones wouldn’t be good at all. It’s a good 20 minute walk into the main part of St Anton. The Spar is the only shop between the hotel and St Anton; there aren’t any other places where you can pick up Mars Bars etc so it might be worth packing some snacks. The boot room had no drying facilities so you would be putting damp boots on in the morning; the best thing to do is definitely to leave your boots and skis in town. The WiFi was expensive to use (30€ for three devices) and you have to be in the bar or restaurant to use it. If you were running a business and needed constant WiFi access it would be a nightmare. "Bad snow but the chalet was fine"
The chalet was fine, no complaints. The snow was dreadful while we were there, although it did improve as the week went on. It was a shame because this meant the chalet wasn’t as ski in/ski out as I had hoped, but it wasn’t difficult to get to the lifts, you could walk across a few fields. Later in the week, once it had snowed a bit more, you could ski down the where the lifts are. "Very friendly, great with the children"
I really liked the friendly atmosphere and the fact that there are lots of families so the children can easily make friends with other kids. The fact that you're not in the middle of St Anton wild nightlife avoids sleep problems with light sleepers and children, but its only down the lane, so you can get in and out easily and quickly (it did it very quickly in ski boots). Its not a long walk to the gondola, but I would advise using the free minibus as it might feel a lot longer if you're carrying the kids gear as well as your own. The little kids crèche is a fun place for them to play and the staff were very organised when dropping/collecting or coordinating with parents and ski school. The rooms are not flash, but all tidy and clean, just slightly tired décor. It's probably the reason this chalet-hotel is one of the best value in St Anton, because you're not paying for fancy furnishing (not something my little boys would really appreciate, or even notice!). The food is good quality and hearty enough to put energy back in, ready for another day on the mountain - and what a mountain! St Anton has some of the best skiing, certainly in Austria and worldwide. When its cold there's plenty of easy runs low down and amazing places to warm up (check out the Hospiz Alm on the run into St Christoph) and when its sunny there's no prettier place - if it gets hot and soggy low down that's no problem in St Anton as the slopes go up unusually high for Austria, so you can find perfect snow up at the top and sunshine to go with it. A wonderful place.